Rust Preventative Paint. An organic zinc-rich coating with over 92% zinc in dry film. Galmet Cold Galvanizing provides long term protection to steel and produces a self healing mechanism where the Galmet Cold Galvanizing is scratched; zinc oxides and carbonates form in the scratch and effectively reseal it. Metallic zinc coatings are universally accepted as the best method of rust prevention. 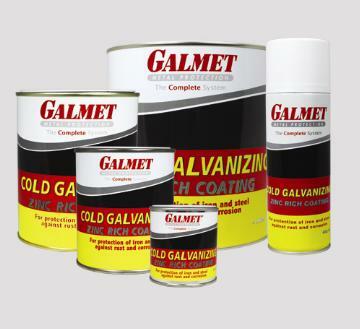 Galmet Cold Galvanizing offers this protection combined with ease of preparation and application.